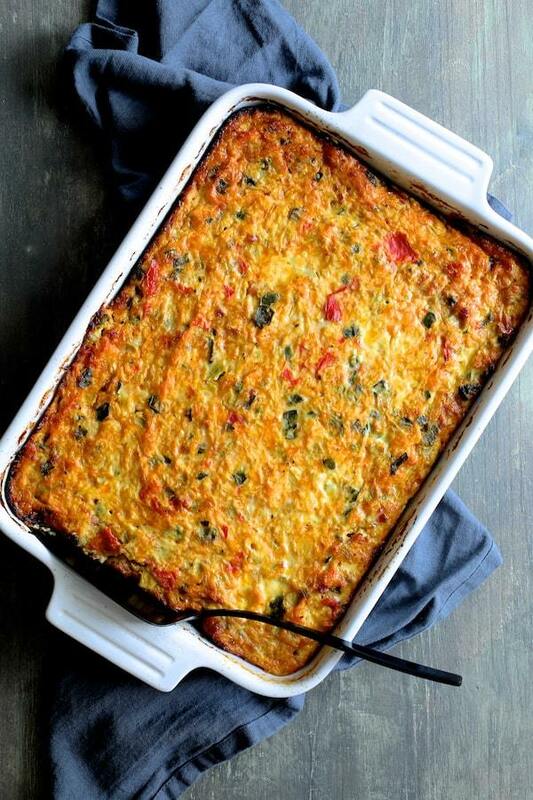 Spaghetti Squash, Poblano and Chorizo Breakfast Casserole is how you do low-carb for breakfast or brunch with flavor! Preheat oven to 375 degrees. Prepare a 13 x 9-inch baking dish by spraying with cooking spray or brushing with oil. Set aside. Line a baking sheet with nonstick aluminum foil. Drizzle the spaghetti squash halves with olive oil and season with salt and black pepper to taste. Turn them over so they're face down on the lined baking sheet. Bake for 35 to 40 minutes or until they can be easily pierced with a knife. Let cool to room temperature. While the spaghetti squash is cooling, brown the chorizo sausage in a skillet over medium-high heat until almost cooked through. Add the Poblanos and continue cooking until the sausage is fully cooked and the peppers are softened. Transfer to a large bowl. Add the scallions, tomatoes, green chiles. When the spaghetti squash has cooled, shred it with a fork into the bowl with the chorizo, peppers, scallions, tomatoes and chiles. Stir in the cheese and eggs and mix well. Pour into the prepared baking dish and bake for 50 minutes to 1 hour or until set in the center and lightly browned around the edges.